A Turkish Army TAI T129 attack Helicopter has been shot down in northern Syria, while carrying out combat mission against Syrian-Kurdish YPG militants. The attack helicopter came down near Qaddah village, in Syria, where Turkey is carrying out an offensive against Kurdish fighters. The Turkish military said in a statement that two pilots onboard were killed in the crash at around 1 p.m. local time (10 a.m. GMT). A video shows the helicopter crashing into a mountainous valley, with fumes coming out of the region. Ankara launched the Operation Olive Branch air and ground offensive last month against Kurdish fighters in Syria’s Afrin region. 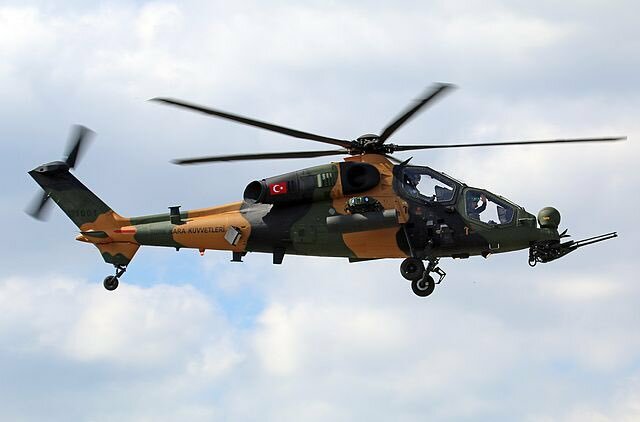 The T129 is a Turkish license built version of Italian Leonardo Mangusta attack helicopter. They were inducted into Turkish Army service in May 2014. The twin-engine, tandem seat, multi-role, all-weather helicopter is designed for attack and reconnaissance roles.